On New York Harbor’s Liberty Island sits America’s grandest monument—the Statue of Liberty. Her message resounds in human hearts worldwide. Freedom. How precious! Yet sadly, one day freedom itself will be taken away by men, governments, and nations. Here’s how it will happen. Unless you’re like the proverbial ostrich with your head buried beneath the sand, then surely you realize that Planet Earth is in trouble these days—big time. Deadly natural disasters, bizarre weather patterns, terrorist atrocities, economic woes, vanishing morality, political corruption, soaring food prices, shrinking water supplies, plus global toxicity—all reveal that we are on the verge of a stupendous crisis. “There shall be a time of trouble,” predicts the Holy Bible, “such as never was. . .” (Daniel 12:1). When earth’s final crisis strikes, a deceptive “solution” will eventually be enforced by governments worldwide during a dark hour of desperation. On the surface, this solution will appear sensible. Yet hidden beneath its allure will lurk a devilish lie. 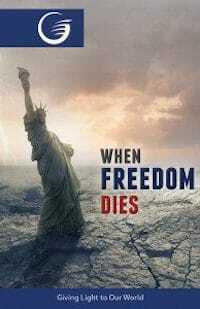 During that fateful time, freedom will vanish—at least from human governments. Shockingly, the Bible calls this globally enforced delusion the mark of the beast. “He causes all,” God’s Word warns, “both small and great, rich and poor, free and slave, to receive a mark on their right hand, or on their foreheads” (Revelation 13:16). The consequences of receiving this evil mark will be disastrous. Whoever knowingly accepts it—after first being urgently enlightened by a loving God to resist it—will be doomed forever (see Revelation 14:9-11). The Bible’s warning is clear. We should take it seriously. If you Google “mark of beast,” you will discover endless opinions. Speculation abounds. Most interpret it as a technological mark, but this is mere guesswork. The Bible further clarifies that “he deceived those who received the mark of the beast” (Revelation 19:20, emphasis supplied). Thus those who receive the mark are “deceived,” or tricked, to their eternal loss. Now think about it. If this deadly “mark”—whatever it is—was utterly obvious, then how could the majority of earth’s inhabitants be misled, as Revelation clearly predicts? “. . . worship Him who made heaven and earth” (Revelation 14:7). “Here are those who keep the commandments of God and the faith of Jesus” (Revelation 14:12). Did you catch that? Those who overcome Satan’s deadly mark do three specific things: 1) They worship the Creator; 2) They keep the commandments of God; 3) They believe in Jesus Christ. “Remember the Sabbath day, to keep it holy. Six days you shall labor, and do all your work, but the seventh day is the Sabbath of the Lord your God. In it you shall do no work. . . . For in six days the Lord made the heavens and the earth, the sea, and all that is in them, and rested the seventh day. Therefore the Lord blessed the Sabbath day and hallowed it” (Exodus 20:8-11). “Of course the Catholic Church claims that the change [from Saturday to Sunday] was her act. . . . And the act is a MARK of her ecclesiastical power authority in religious matters” (letter from Chancellor H. R. Thomas to Cardinal James Gibbons, Nov. 11, 1895, emphasis supplied). Ask a priest. Check Roman Catholic catechisms. “And the act is a MARK” of her supposed authority, Rome boasts. Consider this: When New York City’s Twin Towers collapsed on September 11, 2001, that horrible event occurred on a Tuesday. Five days later, Sunday church attendance soared, not only in America, but worldwide. Why? The answer is obvious. When a serious crisis hits, people pray. They flock to church. Thus, one lesson from 9-11 is that severe crisis leads to a revival in Sunday-keeping. If that past situation had become really desperate, increased Sunday attendance eventually would have shifted to the global enforcement of Sunday laws by civil governments. “Impossible!” some might reply. No, it isn’t. Sunday laws (also called “blue laws”) have already been enforced in various degrees in Europe, England, and America for over 1,500 years. Study history. Ask the Catholic Church. Yes, Sunday laws have been enforced in the past, and they will strike again during earth’s last, global crisis. Enforced in God’s name, such laws will actually deny both His law and His character. God never compels anyone to obey Him. He desires only loving service, not forced obedience. The only thing holding such Sunday laws back today is a serious enough crisis. What unforeseen events will ignite the final fulfillment of Bible prophecy? Only God knows. It might be a series of natural disasters, another terrorist attack, an economic collapse, or a combination of events. When it hits, just like after 9-11, Sunday attendance will soar, which will be followed eventually by Sunday legislation. As strange as it sounds, a careful and enlightened study of Revelation 13 and 14 predicts that these events surely will occur. When the mark (forced Sunday observance) of the beast (the Roman Church) is fully imposed by law (see Revelation 13:16) during earth’s last crisis, then the final hour of decision will have arrived. Those who believe in this tricky deception (contrary to the Ten Commandments) will be marked by sin “on their foreheads” (their minds). Those who don’t really believe the deception but who still obey Sunday legislation will be marked on their hands (their actions). Contrary to current prophetic speculation, only God will see this mark, not humans. Prophecy predicts that many will detect the deceiver in disguise and refuse to receive that mark. Instead, they worship the Creator, “keep the commandments,” and follow “Jesus” (Revelation 14:12), our loving Savior, who died on a cruel cross for our sins of breaking God’s law (see 1 John 2:2; 3:4), and rose from the dead. “If you love Me,” our Savior pleads, “keep My commandments” (John 14:15). Those who do—through His grace and power—will be ready for His glorious return (see Revelation 14:14-16) at the “end of the age” (see Matthew 28:20).